And the winner is...Test Cricket! Australia against the West Indies, David against Goliath, first ranked side against eight. Thought of as a walkover by many, myself included, the West Indies weren’t given a chance in hell of overcoming cricket’s superpower. How wrong we all were. The local side put on a spirited and inspirational showing, led by Fidel Edwards and Shivnarine Chanderpaul; they came tantalisingly close to registering one of the all time great upsets. The fact they were unable to cross that finishing line doesn’t detract from their heroic efforts even one bit. After taking five wickets in the first innings, Edwards’ spell late on day three to leave the tourists reeling at 4/17 is one of the finest of recent times. He looked unplayable and at one stage Australia didn’t look like they would reach 50. If he continues bowling like this, it won’t be long till he’s recognized as the best bowler in the world, but that remains to be seen, he still has a long way to go. And what about the stoic efforts of Shivnarine Chanderpaul? Continuing on his amazing year with the bat, he played patient and risk free cricket to score an incredible hundred and get his side right back into the match. What makes it all the more memorable was the sickening blow to the head he took. Anyone watching it live would have been genuinely scared when the camera focused in on his unconscious body, lying there limp at the crease. You can only imagine how his wife and family, sitting in the stands, would have been feeling at that time. For him to get back up and battle his way to a century says so much about the man’s character and toughness. He is one of the premier batsmen in the world today and he is continuing right where Brian Lara left off. Much has been written about Australia’s supposed decline. With the retirements of Warne, McGrath, Martyn, Langer and Gilchrist in such a short space of time, the end was near. No one can deny the absolute class that is now missing from the side, but to Australia’s credit, they have still been able to win by performing close to the level we’ve come to expect from them over the years, often finding contributions from unexpected sources. In this match, that contribution came from Andrew Symonds. After a scratchy 70 not out in the first innings, the Queenslander showed brilliant guts and determination in the second innings to carry the Australian batting side when all were falling around him. With the scoreline reading a sorry 5-18 at one stage, Symonds dug in, at first with Brad Hodge and later with Brad Haddin and the tail to carry Australia to a less embarrassing 167. It will go down as one of his finest knocks. 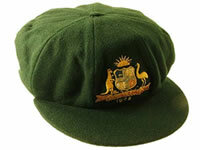 Without it, there was little chance Australia would have won the match. Ricky Ponting also showed the world that he’s back in town after a quiet home season, putting on an almost flawless 158 in the first innings. With many writing him off as past his best, the world’s best batsmen silenced his critics with a dominating display with the bat. Full credit as well must be given to the official Man of the Match, Stuart Clark. Proving he was anything but a one season wonder, the New South Welshman looked a class apart on the helpful surface as he decimated the West Indies top order on the fifth morning to take a much deserved five wicket haul. He had help from Brett Lee who started the match off poorly but came back well only to have quite a few catches dropped off his bowling. Those two had little help from their two remaining bowlers Mitchell Johnson and Stuart MacGill who looked unthreatening for most of the match. MacGill is past his peak, an excellent bowler during his heyday, he is now either too old or too unfit for Test match cricket and should not play for Australia again. Some of the deliveries during the Test were truly embarrassing and the number of good balls he bowled could be counted on one hand. Johnson wasn’t much better, but with time he’ll improve. The Test was riveting, with ebbs and flows and all three outcomes possible for much of the five days. If the rest of the series is anything like the first match, it’ll be one that not many will forget. Over in England a match just as good was being played. It was another one that will be talked about for some time to come. It started off with one of the knocks of the year. Ross Taylor stunned the Old Trafford crowd with a mesmerising 154 that included 17 fours and five sixes. The way he lifted another gear towards the end of the innings was something that not many can do. There’s little doubt that this youngster will be around for some time to come. New Zealand’s first innings won’t be forgotten for some time for other, more infamous reasons after Daniel Flynn sustained a vicious facial injury from a James Anderson bouncer which whacked him on the grill of his helmet. It was a rather unwelcoming debut to Test cricket for the youngster and he took no further part in the match. But like many of the batsmen in both England and Jamaica will tell you, Test cricket isn’t for the fainthearted. After making 381, the underdogs New Zealand, were then able to turn the screws with captain Daniel Vettori tormenting the English batsmen in helpful conditions to end up with superb figures of 5-66, restricting England to 202, 179 runs behind New Zealand and looking well and truly out of the game. The result seemingly a certainty. But as this match proved, in Test cricket you can never really be certain of anything. Panesar, refusing to be outdone by the opposing spinner, ran through the truncated New Zealand batting order, taking a career best 6-37, to leave New Zealand on a paltry 114. Still, going into the fourth day with an out of form England batting line-up needing 294 to win, the visitors were firm favourites to take out a famous victory. But, much like the Australia-West Indies match, the hero came from an unlikely corner. Less than half a year ago, Andrew Strauss’ career looked over. Poor form in Australia that carried into the home series against the West Indies and India had many calling for his head. But on a fifth day pitch he showed the country that he may have turned the corner after he played a spectacular match winning knock of 106 to give England a memorable come from behind win. An initial critic of the IPL, I’ve come to appreciate the format. It’s too long and drawn out, but it has a lot of potential and some of the games have been classics. Take the game last night for instance; where Rajasthan won on the last ball, it was edge of your seat stuff. In fact the Rajasthan story has been one of the great cricketing tales, a team of nobodies led by an ageing legend of the game have dominated the other star studded line ups. Teams that shelled out many more millions for their players have been put to shame by this tight knit and resilient group who have captivated the imaginations of the cricketing world. But at the end of the day, it just doesn’t compare to the real deal, Test cricket. The drama, the emotion, the relief and the disappointment is unparalleled. As this week has shown us, as a spectacle, not just in cricket or even in sport, but in life itself, there is nothing quite like it. Yeah I blogged about this on my site Past Point. IPL\’s future is very limited and support for Test Cricket will always be larger. It was also wonderful to see two countries that had been falling away in Tests become competitive again. The decline of New Zealand and, more so, the West Indies in recent years has been well documented. The sport is in a much healthier state with them in good form.